Ladan Pourmasiha, D.O., is a board-certified family medicine physician serving patients 6 months and up. A graduate of Nova Southeastern University’s College of Osteopathic Medicine, Dr. Pourmasiha completed her residency in family medicine at Palmetto General Hospital in Hialeah, Florida. Dr. Pourmasiha decided to become a physician because she enjoyed being a problem solver, and she wanted to give back and help others. Fluent in English, Farsi, and medical Spanish, Dr. Pourmasiha treats a variety of conditions including minor illnesses, sprains, broken bones, lacerations, and cuts among others. Through each visit with her patients, Dr. Pourmasiha seeks to show how much she truly cares about them. With a caring and warm personality, she takes time to listen to her patients and create a plan of care that they can feel confident in. For her, the very best part of her job is getting to see her patients feel better and get back to their active lifestyles. 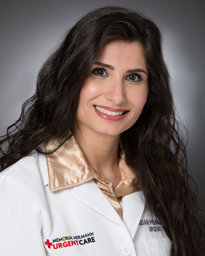 In her spare time, Dr. Pourmasiha enjoys traveling, shopping, and spending time with family and friends. Ladan Pourmasiha, D.O., practices at Memorial Hermann Urgent Care in Fulshear.